Phnom Penh (FN), Jan. 22 - The Royal Government of Cambodia will take legal action against Sam Rainsy, Leader of Cambodia National Rescue Movement, shall there be any request from the court, according to a statement from the Royal Government Spokesman Phay Siphan dated Tuesday. Sam Rainsy’s repatriation is purely personal, and that Rainsy’s self-exile was also personally decided. 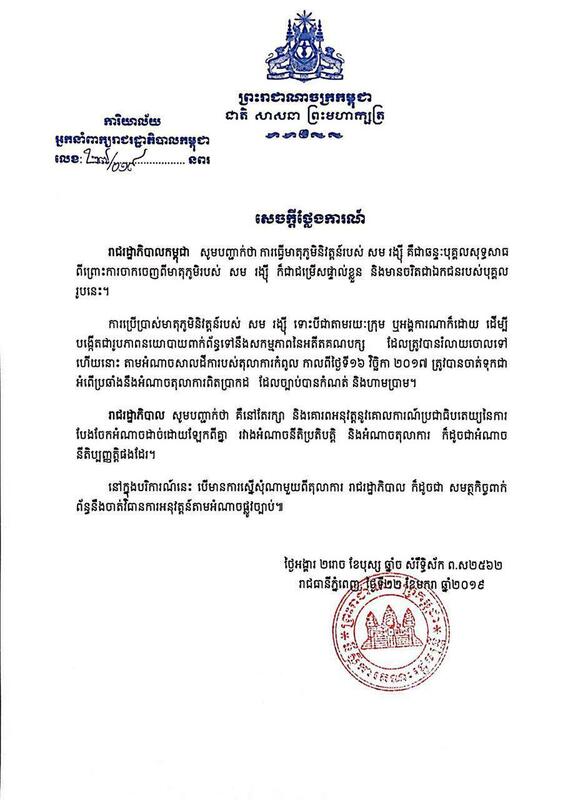 The use of Sam Rainsy's repatriation, through any group or organization, to create a political image pertaining to the activities of the dissolved Cambodia National Rescue Party is regarded as an act against the law, according to the statement. The government's warning came after former Vice President of CNRP Eng Chhai Eang claimed that the Standing Committee’s meeting in Lowell, USA, aimed to prepare for Rainsy's repatriation to Cambodia. Rainsy has announced to return to Cambodia again and again after he exiled himself in 2016, but he never did. Sam Rainsy has been subsequently sentenced by a Cambodian court to five years imprisonment, charged with forging Cambodia-Vietnam Border Documents and sentenced to 18 year imprisonment in a separate case for defaming Prime Minister Hun Sen as a man behind the murder of political commentator Kem Ley.